Mexico City is a surprisingly undiscovered destination. 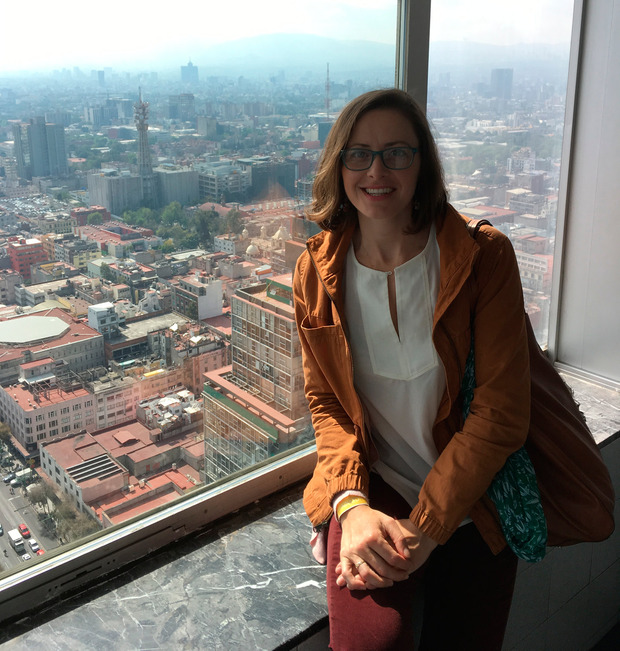 While Mexicans who live there or travel from surrounding areas understand the allure of the city, we saw so few tourists we sometimes wondered if we were exploring the wrong spots! But we weren’t — and instead were simply able to enjoy the city among locals. 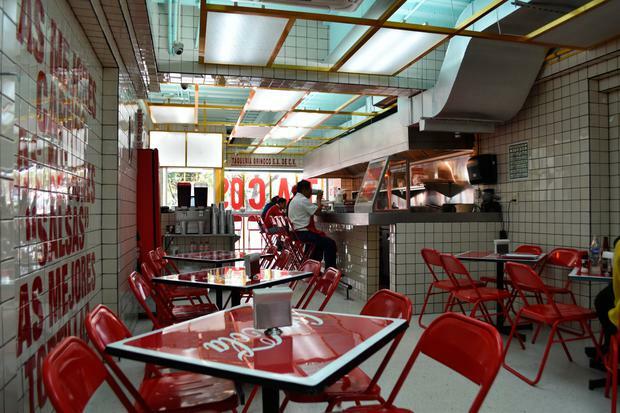 Picture a cross between a southern Spanish city and perhaps Cuba, and that’s where you land in Mexico City. The place has the patina of a European city that other North American hubs don’t, and while affected by recent earthquakes, the overall damage has been minimal and things are ticking along, ready for new explorers. In a world of overtourism, finding a seemingly off-radar city of over 21 million people that still feels cosmopolitan is a gift. Standing 44 stories tall, the Torre Latinoamericana was the world’s first skyscraper built in an active earthquake zone, which might make you a little nervous as you ascend in the elevator. But for about €4.50, you’ll gain admission to the viewing deck as well as a museum of Mexican history and find the view from the top deck is unparallelled and panoramic. You aren’t allowed to use cameras larger than a phone, so make sure you can pack yours away in a bag for the visit. If you like that: Try the Museo Nacional de Historia for another beautiful view (mnh.inah.gob.mx). Prior to Spanish colonial takeover, the main square in Mexico City’s historic district — called the Plaza de la Constitución, or locally, Zócalo — was the main celebratory centre of the Aztec city of Tenochtitlán. 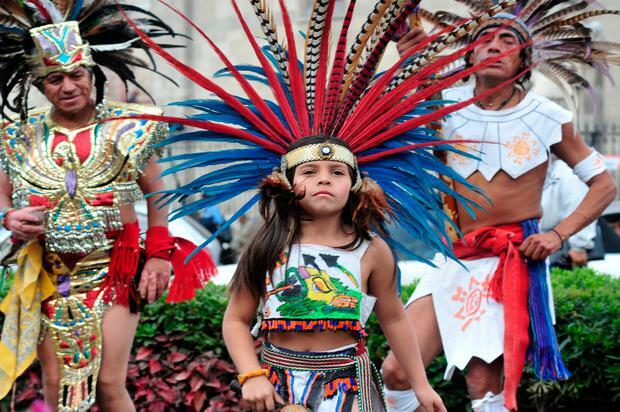 You’ll regularly see indigenous people dressed in Aztec costumes performing traditional rituals (above) to draw attention to their culture and ruins of the Templo Mayor (‘Main Temple’). Zócalo has grand buildings on each side, but for an even better perspective, La Casa de las Sirenas (lacasadelassirenas.rest) is the perfect location to see out over the main square while sipping a margarita under the cool shade of an ancient stone building. Details: Plaza de la Constitución S/N, Centro Histórico, Centro. Take the Metro Line 2 to Metro Zócalo. If you like that: Visit the incredible and historic Palacio de Bellas Artes. We’re all well acquainted with burritos, but tacos are the real Mexican favourite, with copious options for breakfast, lunch, or an anytime snack. A local favourite is a café called Taquería Orinoco. The interior is loud and flashy, and the tacos are top notch. Each order comes with a selection of several salsas, which you’ll definitely want to taste before you pour all over your taco. Some are especially caliente! If you like that: Look for taco joints on the corner of most streets — as a rule, the busier the taco spot, the better. Another spot for an awesome view of the city — and a giant dose of history — is the Museo Nacional de Historia at the stunning Castillo de Chapultepec. The castle sits high above the city in Chapultepec Park, one of the largest parks in the western hemisphere. On a weekend day you’ll find it full of locals attending large open air markets and making the trek up to Castillo de Chapultepec. The castle itself is now a museum, but you might want to pay for one of the English-speaking tour guides to get the full benefit of the history lesson — since all of the signage is in Spanish. Details: Bosque de Chapultepec; 51 pesos per person. Be prepared to walk uphill from the entrance for about 500 metres. If you like that: Try the Parque Nacional Desierto de los Leones, with miles of hiking trails and a beautiful abandoned convent (desiertodelosleones.mx). 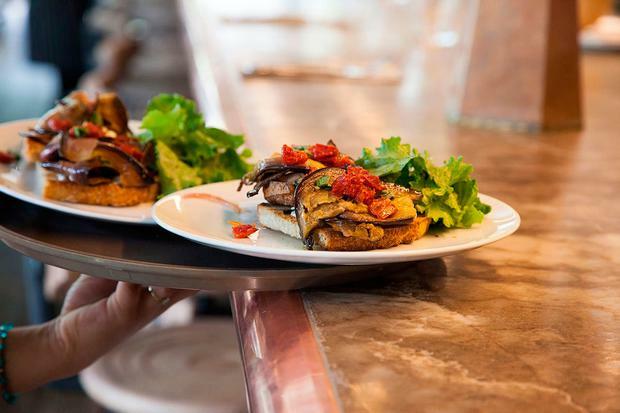 It can be difficult to wangle a table, especially at the last minute, but lunchtime reservations at Lardo (pictured) — where Elena Reygadas, voted Latin America’s Best Female Chef in 2014, cooks a Mexican take on Mediterranean food — can be made a few days in advance if you’re willing to sit at the bar. The restaurant itself is beautiful, and the food is fresh and authentic. There are two menus, one in English and one in Spanish — be sure to ask your server for a recommendation from the original menu, as not all of the dishes are offered on both. If you like that: If Lardo sounds like it’s up your street, try Regadas’ other restaurant, Rosetta (rosetta.com.mx). 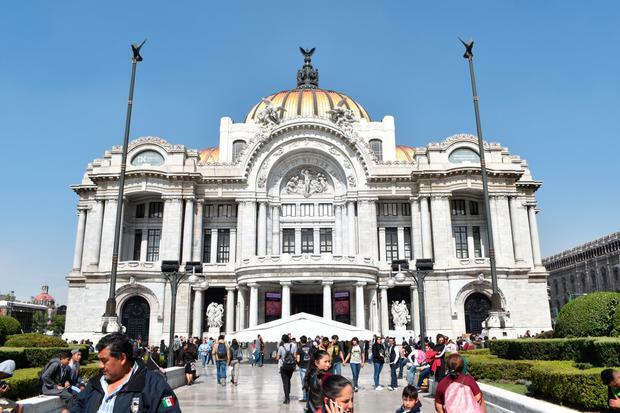 The Palacio de Bellas Artes is an Art Nouveau masterpiece on the outside, including a shining orange and yellow dome, and Art Deco on the inside. The space includes a theatre (its Tiffany glass curtain is stunning) and the building is recognised for the extensive murals by Diego Rivera and Siqueiros. The Palacio also sits on the edge of the Alameda Central park, which is well worth a stroll. If you like that: Visit the Frida Kahlo Museum (museofridakahlo.org.mx) for a deeper look at this important artist. While I do love a good breakfast taco, I often need more fuel for exploring a new city. Enhorabuena Café in the trendy Condesa district makes delicious coffee and artful food, like quinoa bowls with sweet potato, fried eggs and avocado. The open-front café is perfect for people-watching, too. If you like that: If you love coffee and need an afternoon fix, try Buna 42 (buna.mx) and scoop up a pastry as well. If you can manage it, leave room in your suitcase to bring home at least a few souvenirs from the Ciudadela Market. You’ll find hand-painted pottery and glass, embroidered tapestries and pillows, and dresses and wall hangings. And you’ll want it all. Bring cash or visit the ATM around the corner... vendors are prepared to barter a little if you’re ready to practise your Spanish! If you like that: For more shopping, visit one of five artisan stores, Fonda Nacional para el Fomento de las Artesanías (gob.mx/fonart). Mexico City has a public bike system (ecobici.cdmx.gob.mx), but it also has the traffic you’d expect with 21 million people, so choose the right place to explore! La Condesa neighbourhood is quiet and safer for a cyclist who’s new to the area, but it’s also home to some of the city’s coolest parks, stores and museums, with lots of Art Deco architecture and tree-lined streets. If you like that: If you like cycling in La Condesa, explore La Roma, another up-and-coming neighbourhood with hipster boutiques and quaint coffee shops. Nightlife starts late in Mexico City, which means you should linger over dinner and have a few glasses of Mexican wine before heading out for some live music. Like many arid countries, Mexico produces delicious wine, both red and white, but not enough to export. And make sure you sample at least one mezcal, the smoky, rising star of the tequila family. If you like that: Pick up a bottle of sal de gusano, what each of the pottery shot glasses is rimmed with. Just try to forget that it’s made from crushed moth larvae! 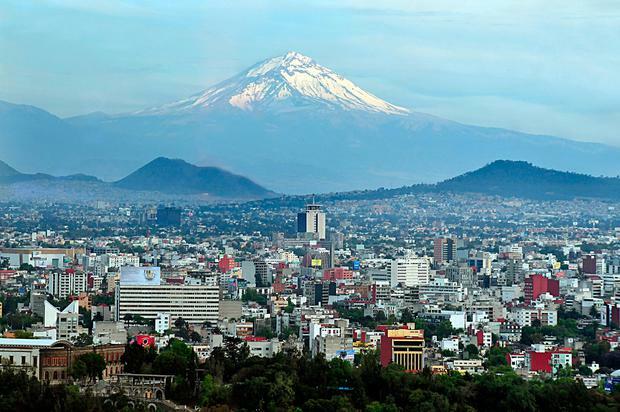 Mexico City sits at a high altitude, over 7,000 feet, so winters can feel colder than other places nearby... and summer feels dry and hot. Pack mosquito repellent, sunscreen and a hat in the summer, and lots of layers for winter. 50 of the best holiday hotspots for 2018: Kick start your year in travel!